The EPA has an interesting report on the cap-and-trade programs for acid rain pollutants. These markets have led to dramatic reductions in the pollutants while costing industry (and therefore consumers) relatively little. 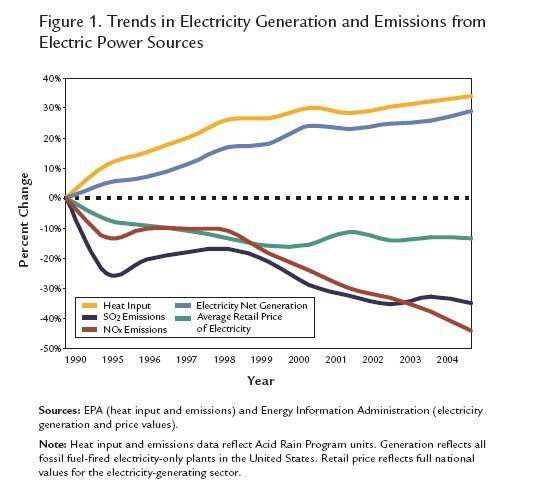 This is reflected by the fact that electricity prices have also fallen since the advent of the acid rain pollution markets. Anybody who is serious about reduction of large-scale pollution from large sources sees cap and trade as the leading method of reduction. 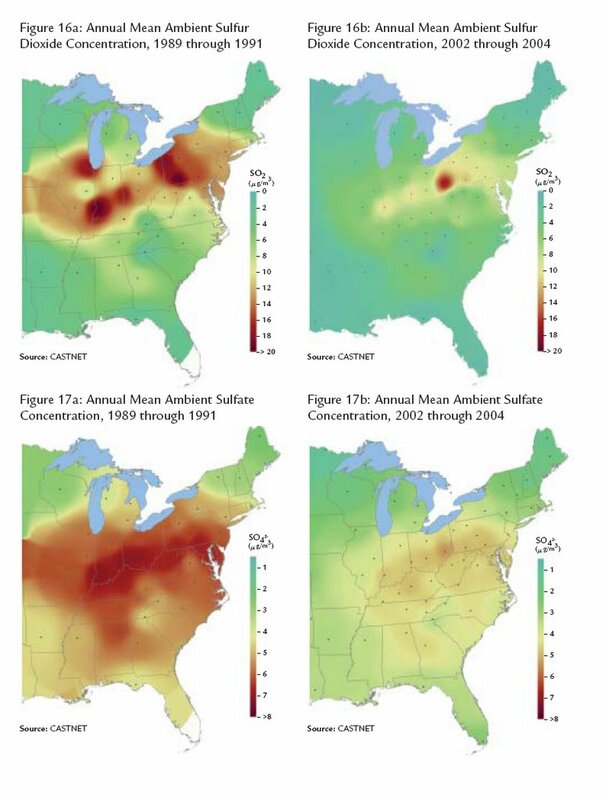 The program has been so successful the EPA has been able to set new ambitious goals of reducing sulfates by a further 70% and nitrates by a further 60% without serious objection from Republicans. The next big challenge is carbon dioxide, the probable main cause of global warming. The European Union Emission Trading Scheme is the first stab at this. According to critics the European authority has given away too many grandfathered credits and bought too few back, causing the price to decline too far and, allegedly, too few actual emissions reductions to be implemented. While emission markets themselves work remarkably well, where the actual cap of emissions should be set remains a political hot button. Fortunately, the pollution market also makes it far easier to far more accurately estimate cost-benefit ratios, thus greatly informing the political debate. Besides the cap level, the most interesting debate is over auctions versus grandfathering for allocating the initial rights. While the U.S. acid rain market achieved great results with grandfathering the initial credits, it's probable that emissions markets would work even better by auctioning off the inititial credits rather than giving them away based on current emissions. Grandfathering creates an incentive for polluters to increase their emissions in the years befor the grandfathering levels are determined. On the other hand, there's an argument to be made that current emitters have by their legal operations developed prescriptive rights to their current levels of emissions, and the acid rain markets have demonstrated that grandfathering works. The U.S. market also shows that it takes some time to develop these market institutions. An initial dry-run period which focuses more on developing the market and monitoring institutions rather than steep carbon dioxide reductions is probably a good idea. Once the institutions have evolved into an efficient form dramatic reductions in carbon dioxide emissions from large sources will likely be possible, as indicated by the EPA now being able target dramatic reductions after a decade of acid rain emissions trading. The third interesting issue is whether to include third party carbon dioxide sinks in the market. This would be a novelty not yet tried in other pollution markets, but it makes quite a bit of sense since we don't really know yet whether emissions reduction or creating carbon dioxide sinks is the better strategy for carbon dioxide reduction. The market should motivate both solutions. But measuring the amount of carbon dioxide sunk, and determining for how long a period into the future it must be sunk for, are among the novel issues to be addressed. The fourth issue, crucial to getting carbon dioxide markets to actually cut back the rising global emissions, is to extend them to other developed countries and, most challenging of all, to developing countries. The creation of any "asset" raises the problem of initial allocation. Auctioning off the assets to the highest bidder is a distortion because the seller then becomes an active party; in the G3 auctions in Europe, the various states seem to have pushed up the prices and somewhat damaged the market by draining the capital from the bidders. To my mind, the best deal is whatever gets the assets into play the quickest, and ignoring the sense of fair initial allocation. The purpose of the assets and property trade in general is to move information around, and that only happens once they are in play. The registry rewriting problem could have bee prevented by distributing control over the registry, as in secure property titles. This is also probably a good idea for keeping track of carbon dioxide rights between countries that don't trust each other, and might even in the future be at war. We should also distribute control over carbon dioxide monitoring, so that countries can monitor each other. Call it a "smart treaty." I agree that low transaction costs are more important than fairness for initial allocation. Politicians and lawyers could argue forever over what is fair, by which time we will have squandered substantial sums while carbon dioxide keeps climbing. I'm concerned that many people won't realize this and I'm afraid we will see many stupid and bitter debates over the fairness. That side-by-side comparison is quite dramatic! But carbon dioxide is going to be harder because only about half of it is large source. About a third is very small source, such as cars. Another reason to include sinks in the market is that they tend to be larger scale and thus could easily be worked into the market and make it more liquid. There have been proposals and experiments to extend the market to smaller sources, but these are high transaction cost and we should do the larger sources first to debug the market. BTW, besides sinks should we include large scale cooling projects such as the project to put a vast Venetian blind between the earth and sun? Like a sink they should be able to sell carbon credits, but we'd have to specify by law how to convert sunlight units into carbon dioxide units.